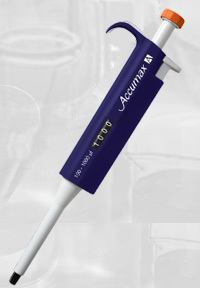 Accumax A completes our range of micropipettes with the Fully Autoclavable feature while maintaining the light weight and ergonomic design and ensuring high accuracy and precision. Of the selected volume with click-stop mechanism ensures accurate aspiration & dispensing of the liquid. Pipette makes your job less tiresome and improves efficiency. Offers highest resistance to shocks and chemical corrosion. The smooth plunger mechanism offers least resistance for easy operation. For smooth ejection of the tip preventing any contamination. Click-stop digital system for volume setting. Ergonomic Design ensuring light weight & soft plunger movement. High accuracy and precision guaranteed. Two step plunger operation allows “reverse pipetting technique”. Individual serial No. permanently marked on each pipette. Calibration as per DIN 12650 & ISO 8655 standards. Calibration report enclosed with every pipette.